Armadillo is a Spanish word meaning "little armored one," referring to this mammal's unique suit of armor. Closely related to sloths and anteaters, armadillos most frequently live in warm habitats; their lack of body fat and slow metabolism prevent these creatures from surviving in colder climates. Excellent excavators, armadillos will dig burrows, climb in and sleep up to 16 hours per day. Of the 20 known species of armadillos, the majority live in grassland or savannah regions. Located between the hot, humid equatorial region and arid deserts, savannahs have one short rainy season during an otherwise dry year. An intermediate area between grasslands and forests, savannahs are marked by sparse trees or clumps of trees and scrub brush that blooms during the rainy season, then dies off after the weather dries out. 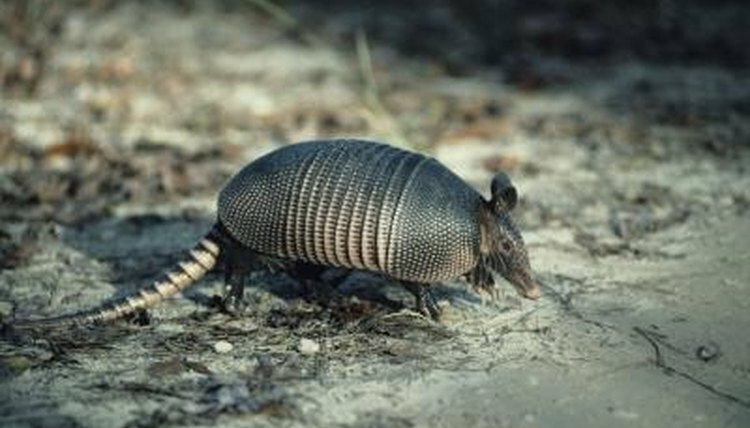 The three-banded armadillo, the diminutive pink fairy armadillo and the aggressive yellow armadillo are some of the armadillo species inhabiting savannah habitats. The nine-banded armadillo, also commonly known as the Texas armadillo, is the only species of armadillo to stray out of South and Central America and venture as far north as the United States. In 1995, the nine-banded armadillo was named the official small animal of Texas, although he may occasionally be spotted in Oklahoma, Kansas and Louisiana. While found primarily in the savannahs of South America, those living in Mexico and North America will also inhabit deserts, although they don't tolerate extreme high temperatures well. Desert regions are generally arid, receiving less than 10 inches of rain per year and unable to sustain more than sparse scrub vegetation. There are four species of cabassous armadillos, also known as naked-tailed armadillos. While these creatures have the trademark bony plates covering their bodies, their tails remain exposed and unprotected. Cabassous armadillos will range from dry, open savannahs to tropical rainforests. Tropical habitats are typically found near the equator, with plenty of sunshine and drenching rains that promote thick vegetation growth. In the southern hemisphere, the rainy season occurs from November through February. The wide bands of Earth found between the Tropic of Cancer and the Arctic Circle in the northern hemisphere, and between the Tropic of Capricorn and the Antarctic Circle in the southern hemisphere, are known as temperate regions. Armadillos may venture into these areas, although they would not likely survive in the extreme north and south. Since armadillos are strictly a New World creature and only live within the Americas, no armadillos inhabit Mediterranean climates, and with no tolerance for cold climates, armadillos do not live within polar climates. How Thick Is the Shell of an Armadillo?